Developing the right compound (material) is a crucial step in the design process. In their original state, most elastomers have limited commercial value. Therefore, a compound "recipe" must be developed to enhance or add to an elastomer's inherent physical and chemical characteristics, and to ensure efficient molding or extruding. It is important that a material is further developed to meet any necessary industrial specifications, such as ASTM, BS, SAE, UL, FDA, NSF International and U.S.Military Standards. Are there any unique physical properties indicated? To develop a final recipe that meets a given set of specifications, rubber compounders have a wide variety of “ingredients” at their disposal. The basic component of all recipes; elastomers can take the form of a single polymer, or they can be used in various combinations. These aids modify the compound during mixing and processing, or during the extrusion or molding process. The addition of vulcanizing agents to a compound's composition is what converts the formless rubber compound into a permanent extruded or molded shape upon interaction with the heating source. Accelerators increase the rate of vulcanization (or cure), and in many instances also improve the final product's physical properties. These activators work with accelerators to reduce vulcanization (or cure) time and improve a compound's final characteristics. Materials, such as antioxidants and antiozonants, that serve to slow down the deterioration of rubber products that can occur as a result of exposure to light, heat, oxygen, radiation, ozone, etc. Fillers are used to reduce costs, reinforce or alter physical properties or facilitate final processing. Can be used to promote polymer elasticity, aid in the mixing process, increase tack or extend/replace a portion of a polymer's hydrocarbon content. This category of ingredients includes the color pigments, blowing agents, odorants, retarders, abrasives and dusting agents that are normally used to impart very specific characteristics to a compound. Once a final recipe has been determined, the specific time, temperature and order of ingredient addition are critical in mixing compound batches that repeatedly meet desired specifications. Since conditions for each recipe vary, it is important to have mixing equipment that is versatile and equipped with features that maintain complete repeatability control from batch to batch. Two types of mixers are most widely used in today's mixing facilities : Open Two-Roll Mills and Internal Batch Mixers. Open Mills are used predominantly for warming compounds in preparation for subsequent operations, or for adding curatives to pre-mixed master batches. Internal Mixers can either be of tangential or intermeshing rotor design. These mixers perform the same function as an open mill, only the mixing takes place in an enclosed cavity where greater control can be exerted over physical and rheological properties. Continuous Mixers, as opposed to batch mixers, are also available. They require greater attention to material preparation & continuous weighing and feeding of all recipe ingredients. However, when used correctly, continuous mixers can produce a uniform, high-quality product and significantly reduce overall operating costs. In the extrusion process, the Rubber Compound, which includes the polymer (EPDM), fillers and additives such as pigments, curing agents, antioxidants and processing aids, is fed into an extruder. The extruder consists of a rotating screw inside a close-fitting heated barrel. 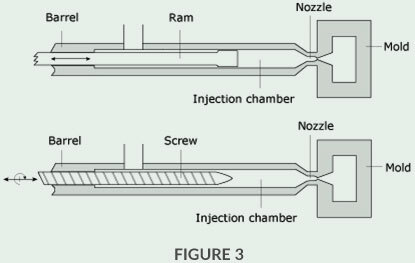 The purpose of the extruder is to soften and pressurize the rubber as it is continuously transported to a die head containing a specific part profile at the extruder exit. Therefore, extruded products have a consistent cross-section along the entire length of the product. Typical extruded rubber products include continuous sheets, tubing, and specific part-profiles for seals and gaskets, and weather stripping. The die is a metal head that is attached to the end of the extruder. Each die consists of an individually machined part-profile opening specific to every seal or gasket. Pressure, built up by heat and the rotating screw, forces the rubber through the die opening—forming it into one continuous profile that had been previously machined into the die. When the rubber shape (extrudate) exits the die, the material swells so that the part cross-section is larger than the die cross-section. This phenomenon is called "die swell," and depending on the rubber formulation and the extrusion conditions, the dimensions of the extrudate may be increased by several percent to several hundred percent beyond those of the die. Furthermore, except for circular cross-sections (i.e., circular cords), the rubber does not swell uniformly in all directions. For example, in order to extrude a square cross-section, the die must be cut so that the sides of the square are curved inward. Upon exiting the die, the rubber extrudate must be cured or “vulcanized” to maintain its shape and acquire the physical properties necessary for the application. This is accomplished by a chemical reaction (the cross-linking of molecules) from peroxides or sulfur curing agents. Vulcanization is initiated when the extrudate temperature is raised by passing it through a curing media, such as a molten salt bath, microwave and/or a hot-air process. Part dimensions change somewhat during the curing process, so this must also be accounted for in the die design. Curing is the final step in the rubber extrusion process, although the extrudate frequently undergoes a value-added operation, such as slitting, splicing, cutting to specified lengths or application of pressuresensitive adhesives. Note: Thermoplastic elastomers by nature do not require vulcanization in order to achieve part shape. Instead, the material is hardened simply by cooling in a cold-water bath. Polymer products may also be shaped into their final form through a molding process. In this process, the final shape of the end product, such as a ball, is determined by the shape and contour of a mold cavity. Molding is used when the final product needs to be conjoined and transitional between planes, as opposed to the continuous, non-transitional profile of an extruded product. There are three basic types of molding processes used to shape polymer products: compression, transfer and injection. Other forms of molding, such as bladder molding, are variations of the three basic types. Compression molding takes place as two plates of mold are forced together. A slightly oversized rubber preform (raw compound) is shaped to approximately fit into the mold cavity. When the plates are squeezed together, the preform is compressed and forced to conform to the mold cavity. A molding press is used to provide the necessary force to close the mold. Excess material, or flash, that squeezes out is pushed into grooves cut into the top plate and later trimmed off. Once the curing or vulcanizing process is complete, the mold is opened and the molded product can be removed).